History; a unique and wonderful pattern woven in the fabric of time. 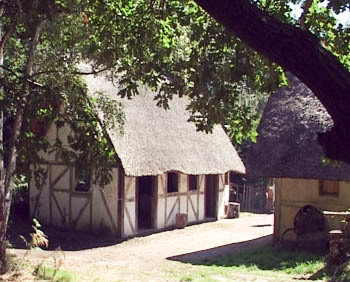 The Living History Village of Little Woodham is dedicated to recreating English rural life in the South of England during 1642. Within the Parish of Rowner, surrounded by woodland, the village of Little Woodham exists to educate both children and adults about 17th Century life at the outbreak of the English Civil War. In the April of 1642 the King of England, Charles Stuart and his Parliament stood on the eve of Civil War. The momentous events of that year unfold as the fall approaches. Using extensively researched local events and people the villagers link their families and their lives to national and international events. 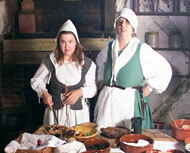 During your walking tour you will meet "villagers", interpreters dressed in historic period costume. 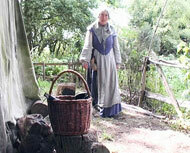 Little Woodham's living history interpreters involve you and your children in their daily lives. Prepare timber with the sawyers at their camp, or speak with villagers as they make lace, or card and spin wool. Those visitors with "good and lawful money of England" may enter Little Woodham's ale-house, there to join in conversation with whomever they may find within. The 1642 Living History Village is widely used by schools as a significant additional teaching resource for the study of History and other cross curriculum areas. From Fareham take the A32 till you reach Brockhurst ,which is just past the Gosport Leisure Centre and Ice skating rink. At the first roundabout take the second exit which will take you over a small hill to the next roundabout. Turn left into Grange Road and turn right when you reach Howe Road. Coliseum, Rome: Over 55000 spectators could watch the Gladiator games held within.